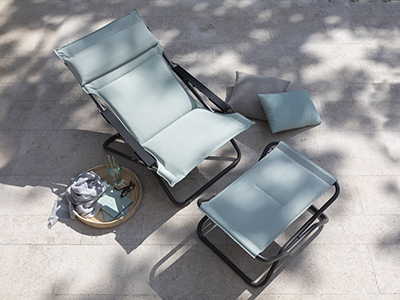 The bain de soleil is an essential of outdoor furniture when creating a relaxation corner at home, with a lounge feeling. On a city patio, in the garden or next to a pool, this garden chair is perfect for basking and enjoying the sunshine. Before setting up the outdoor space, it is best to ask some essential questions. Depending on the area you have, in particular for small spaces, such as a small balcony, check for adequate dimensions. To set up a poolside area, it is recommended to opt for a sun lounger which can deal with water splashes and will resist corrosion. Equally, this garden furniture designed for relaxation will need to stand up to the outdoors over a long period of time. Only a sun lounger designed with quality materials will be resistant to bad weather as well as to UV rays. To have more everyday comfort, remember that some sun loungers cannot be moved around very easily. Heavy, bulky models tend to be left in the same spot. If, on the other hand, you prefer to move your sun lounger around, in particular according to where there is sunshine, choose a portable, light or folding model. A sun lounger differs from other types of chairs. Designed to be in a reclined position, with a comfortable headrest, a sun lounger that can be paired with a footrest, works perfectly for a relaxing moment. It differs from a sun bed which offers a lie-flat position with its multi-position reclining backrest that is chosen for sunbathing or taking a nap while stretching out one’s legs. The deckchair for the garden or chaise longue, is more stylish and comfortable than an outdoor folding chair. For moemts of relaxation, the relax chair is a good alternative which worls well both indoors and outside. Depending on the use it will have, a folding model is preferable, as it is not only easy to move around, but it also has the advantage of being easy to store, saving space once the summer season is over. ”S” shaped models fit the shape of the body, but in a single, fixed position. There are also flat sun loungers: a classic shape which lets you stretch out completely. 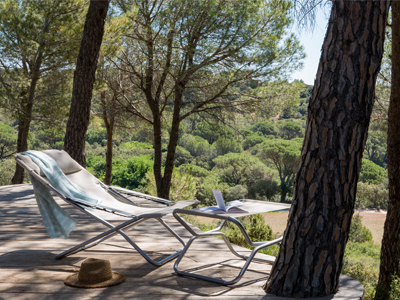 Adjustable sun loungers have the advantage of offering several angles and positions, from half-upright to lie-flat, according to your preference. The choice of material is very important. A wooden sun lounger, for example, is attractive for its timeless look. Acacia or solid teak have an elegant appearance, but it is worth bearing in mind that these materials require regular maintenance to remain rot-resistant. Weight is also a drawback. On the other hand, PVC is a light material, but which has the tendency to heat up quickly. Adding a sun lounger cushion is therefore essential, for example with models made from woven resin. PVC fabric is widely available, usually made of polyester fibres coated in PVC. Attention should be paid to choosing a good quality fabric. 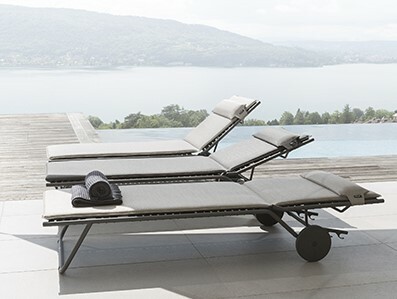 A specialist in outdoor fabric furniture, LAFUMA Mobilier makes sun loungers with different covers. Batyline fabric, is very easy to maintain - just soapy water will do -, and is perfectly suited to outdoor conditions, and is not affected by UV exposure. It is very resistant to ripping, does not lose its shape, and has anti-bacterial and anti-fungal treatments. The brand innovates by also developing ultra-comfortable three layer technical cushions. 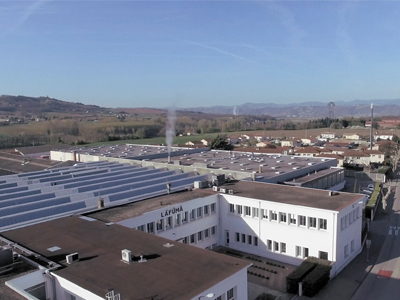 AirComfort® and BeComfort®. Thanks to their permeable materials, (3D Mesh, breathable padding and Batyline®), they do not retain water, they dry very quickly and are ideally suited to outdoor use. All the fabrics used carry the Oeko-Tex® label, that is to say they are certified free from substances which are toxic to the body and the environment. These models with fabric can be designed with a light but insubstantial aluminium frame. Steel will guarantee a robust framework. LAFUMA Mobilier uses an HLE - High Limit Elasticity - steel which combines strength, lightness and durability. Les sun lounger accessories will optimise comfort, in particular for seating. It is possible to add a soft cushion topper, which is easy to install and remove with its elastic straps, or a sun lounger cushion, and don’t forget the cotton beach towel. LAFUMA Mobilier also offers a range of replacement fabrics to change the colour scheme and refresh the outdoor decor in an instant and at a low price.